Please help the Padre Pio Foundation in this world of pain and hunger Please donate to help support this site. Thank you. On his travels through Italy, shortly after the end of World War II, Irish author Seán O'Faoláin arrived at San Giovanni Rotondo, in the sun-baked boot heel of Italy, hoping to encounter Padre Pio, the bearded Capuchin friar who bore the five wounds of Christ. As O'Faoláin waited in front of the chapel, Padre Pio, who was then aged 62, suddenly appeared, beating a path through the crowd on his way to say Mass. Directly in front of him was a sallow, keen-eyed youth. 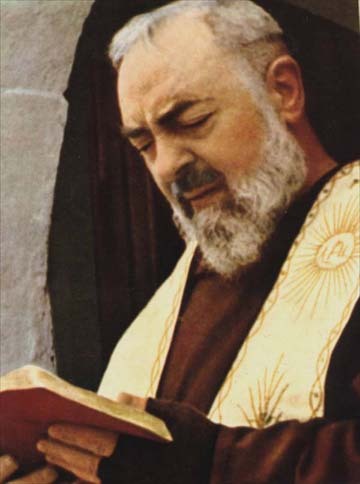 Without pausing, Padre Pio cried out in Italian, "Begone, Satan!" Later that day, the young man explained to O'Faoláin that he was a non-believer who had undergone a serious operation and had only come to San Giovanni to appease his mother. "He frightened me when he said, 'Begone, Satan!' he remarked, "I do not know how he knew that I am an agnostic." There were many mysterious things about Francesco Forgione, or Padre Pio, that puzzled the world since the stigmata appeared on his hands, feet and side in 1918. His ability to see into people's souls was just one of them. Other phenomena included his ability to cure the sick and appear simultaneously in multiple locations. The response of some Italian clergymen, who were jealous of his popularity, was vicious. They accused him of consorting with women, wearing perfume and conducting improper confessions. As a result, he was banned by the Vatican from saying public Masses, hearing lay confessions or meeting with devotees. He was also accused of using carbolic acid to generate his wounds – an allegation dismissed by experts who questioned how he could have gouged them with acid on a daily basis without causing infection or death. Nor did the wounds, which lasted 50 years, reveal any signs of being caused in that way. Exonerated in 1933 by Pope Pius XI, he soon became known, especially in Ireland, for his mysterious powers. Starting in the 1950s, Irish pilgrims flocked to see him and were startled by the miracles they witnessed. The lame cast off their crutches and walked. The blind recovered their sight. Tumors disappeared.